The idea of being a ‘local tourist’ is a reminder that you don’t need to travel far to find something worth photographing – even if you’re looking for something out-of-the-ordinary. In an earlier post I discussed the possibilities of photographing a local Farmers’ Market. 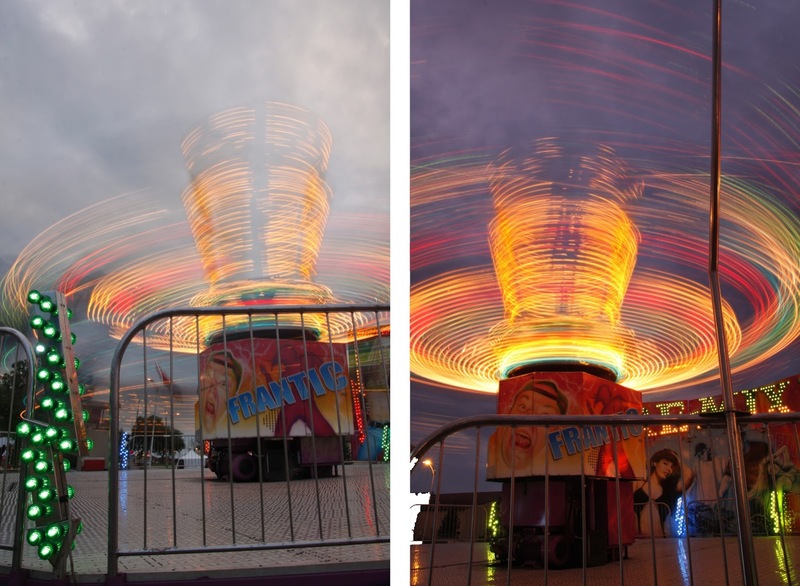 This post will offer tips and advice on how to have fun with long exposure photography at the fair(e). Fairs and carnivals offer a wealth of photographic opportunities. Carnival rides are a staple of childhood memories of summer, and they can be a photographic gold mine. Spend a little time looking, and you might be surprised how easy it is to find a nearby state fair, county fair, church carnival, music festival, or school fundraiser that offers carnival rides. While this post will concentrate on taking pictures of rides at night, such fairs and festivals are also excellent opportunities for candid ‘street photography,’ amazing food shots, capturing performers, and many, many other types of photographs. 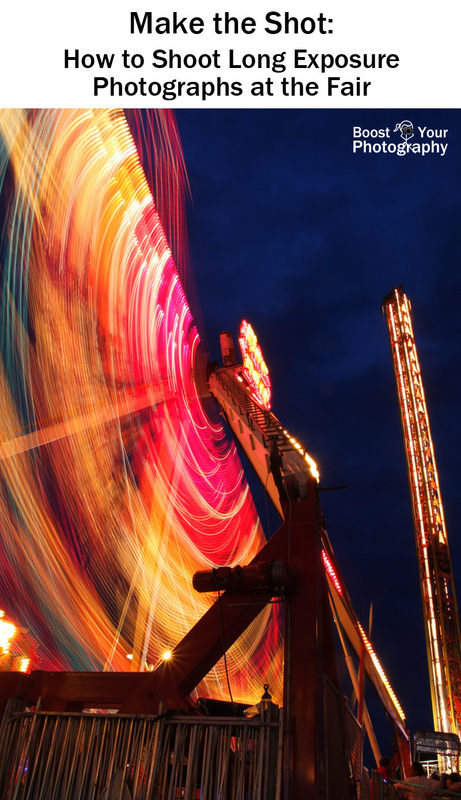 For shooting carnival rides at night, you will need to have a sturdy tripod in addition to your camera. (Read more about how to get the most out of your tripod here. Do not worry about using mirror lock up in this situation, as you want to be able to shoot quickly.) It also useful to have a remote shutter release for your camera. (I use this inexpensive corded shutter release from Amazon.) For lenses, you will want to bring a wide-angle lens to capture wide views of entire rides, such as a kit 18-55 mm lens. Don’t forget standard backup supplies either like spare batteries, an extra memory card, and a lens cloth or Lens Pen for cleaning. Keep in mind that fairs, festivals, and carnivals are often busy, crowded places and that you want to keep your gear to a minimum. For long exposure night photography, the key element in making stunning pictures is the timing. Many photographers are familiar with the term ‘golden hour,’ which refers to the period just after sunrise and just before sunset when the color of sunlight takes on its classic warm, golden tones. The ‘blue hour,’ however, is a less well-known term, and it refers to the period just before sunrise and just after sunset when the color of the sky takes on deep blue tones that are often more visible in photographs than to the naked eye. It is the balance between these deep blues in the sky and the lights from the carnival rides that makes for truly memorable photographs. The two images above show the importance of timing. The left-hand image was taken 15 minutes before sunset (ISO 100, f/22, and 0.6 seconds), while the right-hand image was taken 10 minutes after sunset (ISO 100, f/22, and 2 seconds). In the before sunset image, the brightness of the clouds and sky behind the ride diminishes the impact of the lights and motion, while in the after sunset image, the colors of the ride glow and really stand out. The picture below was taken another 15 minutes later, when the blue hour was in full swing (ISO 100, f/22, and 5 seconds). If you want to know approximately when the blue hour will occur in a given location, you can look up the sunset times. The blue hour generally begins a little while after sunset and lasts until about an hour afterwards. Some websites, such as the Blue Hour Site, allow you to put in a date and location, and it will provide more exact recommendations about the timing of the blue hour. Does that mean you should plan to show up and only shoot during the blue hour? Of course not. I would recommend planning to arrive at least an hour or so early. This will give you time to walk around and scope out locations. Think about angles that will allow you to capture the rides from an interesting point-of-view or in relationship to each other. Also look for places where you can stand outside of the normal flow of traffic to avoid anyone accidentally running into you or your tripod. (This is also an excellent excuse to invite a friend along for some photography. Nothing keeps people out of your way like a group of two or more people with tripods.) Finally, pay attention to where other sources of light are located. Bright street lights can turn into star bursts at f/22 and add additional interest to your image. This image was shot well after the blue hour, but the black sky really sets off the lights. If you have a point-and-shoot camera, you can shoot carnival rides at night using the ‘long shutter’ or ‘night photography’ setting, which allows you to set a shutter speed of a second or longer. If you have a DSLR camera, this is one of those times when you will need to experiment with shooting in manual. My process for shooting with my DSLR is as follows. First, determine the composition: set up the tripod, attach the camera and remote securely, and check the view through the viewfinder. Second, find a bright, visible, stationary part of the ride and set the focus, then switch the autofocus to off/manual focus. (Particularly if a ride involves a lot of movement, your autofocus might keep changing its focus and not take any images.) Third, if just starting and there is still decent light in the sky, turn the dial to Aperture Priority (AV) mode and set a narrow aperture, like f/22. Leave the ISO value low, like 100. Let the camera set the shutter speed and then take a test picture. Here, I set the focus while the ride was loading. Because this ride was swinging right at me, it would have confused the autofocus. Now is when you need to make decisions about what you want to accomplish. Switch into manual mode, and keep the ISO at 100 and aperture at f/22. If the sky or the lights on the ride are too bright in your test image, choose a slightly faster shutter speed and take another picture. If the sky or the lights on the ride are too dark, choose a slower shutter speed and take another picture. Keep adjusting until you find a good balance for the ride you are shooting; then shoot away. Because the light will keep changing rapidly, you will need to keep watching your LCD screen and changing your values accordingly. If you start shooting at or around sunset, you may find that a shutter speed of 0.3 seconds gives a reasonable exposure. By the time the blue hour rolls around, you will likely be able to get shutter speeds of up to 2 or 3 seconds. As the blue hour deepens, you can keep lengthening your shutter speed towards 5 or 8 seconds. If you continue shooting even later, you may find that longer shutter speeds start adding too much blur that you lose individual lights and patterns. In that case, you may want to start changing your aperture to a wider value instead of continuing to increase your shutter speed. Those are the basics of shooting long exposure night photography of carnival rides. The fun comes in trying out different angles and points-of-view and in seeing the effects of varying shutter speeds and apertures. Try getting up close underneath a ride to see how the view changes. Or try getting a longer ways back and lining up several rides in your composition. Take the time to observe and then shoot a ride during its entire process. Many rides rise up or sink down at the beginning and ending and including this vertical change may add extra interest to your image. This image was shot from directly underneath the ride pictured above. You should also consider less conventional approaches. See what happens when you zoom your lens in or out while taking a picture or pan your camera side-to-side on the tripod while shooting. Take your camera off the tripod entirely and see what kind of effects hand-holding can have at a slow shutter speed. If you find a suitable puddle, you can even get down low and play with puddle reflections too. (Read more about the puddle reflection technique here.) Your only limitation is your imagination. Read more about the August Photography Book Club or join us on Flickr - Photography Book Club.